Biologists seek to create increasingly complex molecular regulatory network models. 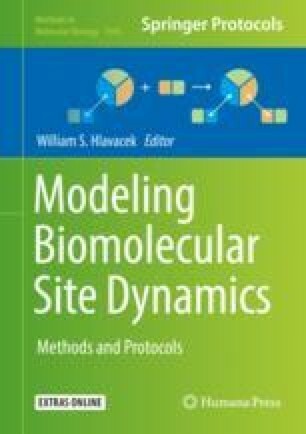 Writing such a model is a creative effort that requires flexible analysis tools and better modeling languages than offered by many of today’s biochemical model editors. Our Multistate Model Builder (MSMB) supports multistate models created using different modeling styles that suit the modeler rather than the software. MSMB defines a simple but powerful syntax to describe multistate species. Our syntax reduces the number of reactions needed to encode the model, thereby reducing the cognitive load involved with model creation. MSMB gives extensive feedback during all stages of model creation. Users can activate error notifications, and use these notifications as a guide toward a consistent, syntactically correct model. Any consistent model can be exported to SBML or COPASI formats. We show the effectiveness of MSMB’s multistate syntax through realistic models of cell cycle regulation and mRNA transcription. MSMB is an open-source project implemented in Java and it uses the COPASI API. Complete information and the installation package can be found at http://copasi.org/Projects/. This manuscript was prepared by Alida Palmisano as a follow-up of the work done while employed at Virginia Tech. The opinions expressed in this manuscript are the authors’ own and do not reflect the view of the National Institutes of Health, the Department of Health and Human Services, or the United States Government.